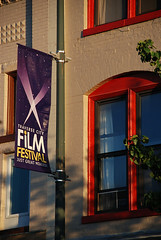 Traverse City Film Festival co-founder Michael Moore, Director Larry Charles, Producer/ Actor Jeff Garlin and others give their thoughts on Traverse City, the state of Michigan and the Traverse City Film Festival in this video by Scott Allman Video. 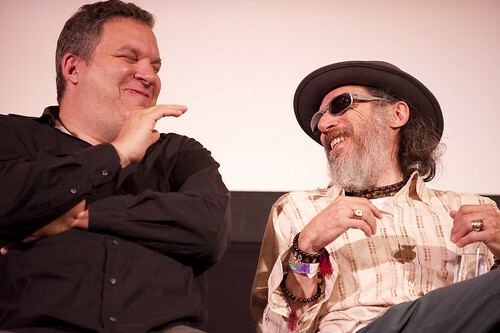 Comedian Jeff Garlin and director Larry Charles share a light moment before the Comedy panel discussion on August 1, 2009. photo by Gary L Howe. One of the coolest things about the festival for me has been talking with people like Jeff and Larry and hearing how much they’re enjoying Traverse City and the state of Michigan. 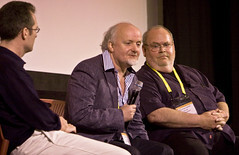 Having truly funny people like these guys introducing films makes it almost like getting a free comedy show thrown in! 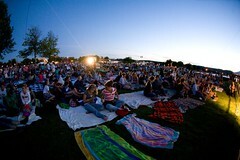 This photo is part of the Day 5 set of photos from the TC Film Fest photographers. Check them all out right here. Thanks to Impact for providing open wireless! Richard Jewell is the new workforce development guy. He will be tasked with developing a Michigan certification program for film crew. Janet warns to be careful when selecting a “film school” as many of them are turning out people with poor skills who can’t get a job. Richard promises that we will develop a program that ensures Michiganians will be employed in the film industry. New Mexico is a target for the state as they are getting tons of projects through the infrastructure and support to the industry they have established. Michael Moore was asked to deliver a report on the Traverse City Film Festival which is estimated to pour over $10 million into the regional economy over the first few days alone. He says that the TCFF has had more than 250,000 admissions over the first 5 years and that this year the festival has drawn filmmakers from 50 countries worldwide. Central was a salute to Scandinavian film. In addition to the opening film Troubled Water, there was the sold out midnight screening of the “Nazi zombie pic” Dead Snow. Picking up on a theme that Cherie highlighted in Festival Inspiration, Michael noted that there were a lot of young folk (including his niece) who probably saw their first subtitled film last night. He notes that one of the purposes of the festival is to increase film literacy and that when they go away to school, they probably won’t feel shy about seeing a film with subtitles. 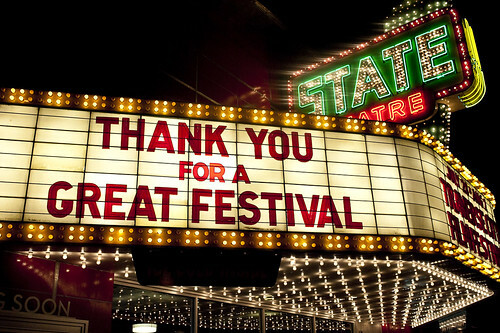 Mike notes that he and festival director Deb Lake will share how they’ve done what they’ve done at the State Theatre and in the TCFF with anyone – call them! He also reiterated that there are no minimum wage jobs on a film set and his hopes that Michigan not let our ship sail in and then sail away. So, after the drink, I’m sitting in the theater and right away, the film goes straight for the meat–are the Jewish people hated or not? Gulp. So first, the director interviews his grandmother. She is proud and strong; still living in Israel, she sees herself separate from Jewish people living in America and elsewhere. Right away the viewer realizes that this film-maker is willing to spare nothing to examine his question–from far corners of the globe and the deep interior of the heart. Though he begins at home, he spans the gamut of opinions on the matter, from New York City to the gates of Auschwitz. Luckily, the director was both witty and compassionate enough to approach this delicate subject with thoughtfulness, care, and an ounce or two of humor. He champions the extreme right and left wings with equal bravado. He listens to their arguments, finds the heart of their passions, and then digs deeper. As the film transpired, I became more and more aware of the delicate nature of this topic. In part because the wounds are generations deep. Fear of atrocity has become so woven into the fabric of the Jewish culture that it seemed to define their existence. One of the teachers interviewed on a field-trip with a group of Israeli teens at a concentration camp in Poland, wonders whether or not he is participating in the perpetuation of a deep cultural fear, leaving one to consider if it is indeed fear–or a kind of love–a deep desire to protect their living families, hence, their futures. Gradually, while viewing the film, I grew more and more aware of my deep inclinations toward foreign documentaries, or foreign movies in general. Instead of handing the viewer an opinion on a silver platter, the director pours a selection of fine Cabernet and allows the tannins to mellow so those dining on the film can wet their inquisitiveness with distinction. If the film has depth, a viewer will appreciate how the subtleties add surprising notes and contrast. And like fine wine, ultimately, it is up to the viewer to determine how successful the artist’s attempt, after battling the elements, was at producing a fine film. Surprisingly the film had a sense of humor, and whether he came up with style on his own or borrowed a slice or two from Michael Moore, Yoav Shamir, presented a documentary that challenged cultural assumptions, past and present, with apparent hope and a deep regard the future.